Continuing along in Blogging through the Alphabet, and this week sounds rather depressing. But it isn't. Why would I blog about that? It is so easy, I think, to focus on success. We want our kids to succeed, right? We want to focus on their strengths. We want to shore up their weaknesses, without calling them weaknesses. We want to build self-esteem. We want to see big accomplishments. And some small ones. I think that is a mistake. Especially as they get to high school. I don't necessarily turn to Woody Allen for advice on homeschooling, but he had it right when he said, "If you're not failing every now and again, it's a sign you're not doing anything very innovative." That idea keeps running around in my mind. You know, if they are always successful, they clearly aren't being pushed enough. How do they get the chance to learn from failure, if they never are allowed to fail? It isn't like I want to set them up to fail. But sometimes, I need to put them in situations where I really don't know if they can get through, and let them go. Sometimes they surprise me and they can do more than I expected. Sometimes, they fail. They need to see that they can fail, and it doesn't change who they are. They need to know that messing up is a chance to learn what doesn't work. And that's a good thing. So what do I do? I let my severely dyslexic kiddo take on running the audio/visual system at church. Skimming over text on the slides while paying attention to what is being said is a serious challenge for him. That one, I really did think he'd blow. In reality, he messed up a couple times, but nothing horrid. I let one try an online writing course at the level he thinks he can do. Only to have him completely fail the course. And you know what? That failure has not destroyed his life. Although I know that messing things up, making mistakes, and looking ridiculous are not things I tend to pray for my kids to experience, I also want them to enter adulthood not being afraid to fail. Being afraid of making a mistake means you are afraid to try something new. That is sad. Colin Powell said, "There are no secrets to success. It is the result of preparation, hard work, and learning from failure." So give them a chance to fail. And love them if they do. Marcy is posting a word study, and this week is F is for Faithful. There are a few dozen other amazing F posts linked up too. Go check some out! Probably the first time I've seen Woody Allen quoted on a homeschool blog. 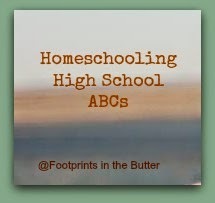 Thanks for writing this series -- I'm finding it so helpful as I begin thinking about homeschooling high school!